It's christmas and Santa is running late with his present delivery and for the first time in recorded history he's been forced to deliver presents during daylight. You're objective is-to help Santa deliver presents to the children of the world. You must select the right colored present that matches the color of the xmas sock. on the ground. A targeting system at the front of the sled will tufn green when it is time to launch the present. Because of his daylight deliveries, Santa is being mistaken by military around the world as an enemy aircraft and many countries are actually shooting at him. 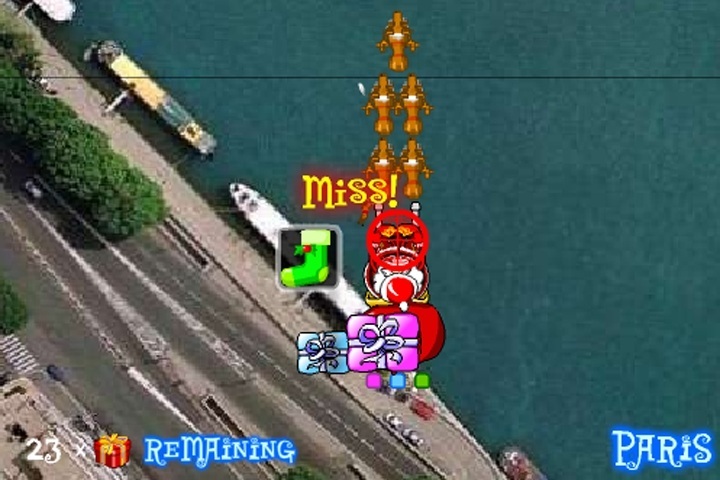 Watch out for missles and other flying objects that can hurt Santa or his reindeer. Try to keep Santa alive as he tries to deliver presents over photo-realistic cities around the world! Use the arrow keys to fly the sled. Space bar activates power ups. If you want to play Santa Drop games online you have come to the right place! GamesLoon adds new Santa Drop games every week. This is your game portal where you can find the biggest collection of free Santa Drop games online. Do not forget to rate our Santa Drop free online games while playing!